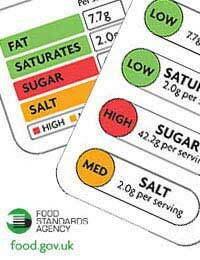 Traffic light labelling is a controversial tool, developed in the UK to help consumers see the healthy and unhealthy components of the food they buy. How Does Traffic Light Labelling Work? Traffic light labelling uses the green, amber and red colours seen on traffic lights to alert food purchasers to the amount of fats, saturated fats, sugars and salts in certain processed foods such as ready meals, pizzas, sausages, burgers, pies, sandwiches and breakfast cereals which have been identified by the Food Standards Agency as foods for which the consumer finds it particularly difficult to understand nutrition labelling. The system is controversial because not all food manufacturers wish to use it and some supermarkets have devised their own systems which means that it can be very confusing and impossible to compare like with like because the labels are not standardised. If you see one or more red light (or in some shops, red segments in a circle) on the front of a food packet, they indicate that the contents of the packet are high in an ingredient everybody should be trying to cut down on: it may be saturated fat, salt or sugar – the actual ingredient will be written alongside the light, with the amount in grams listed too. While eating that food occasionally is fine, the traffic light system alerts you to the fact that it may not be benefiting your health to consume it on a regular basis. An amber light or segment means that the food isn’t either high or low in the nutrient in question, meaning that it is an acceptable food item to eat quite regularly although there are going to be healthier options for the consumer if they desire to cut down on that particular ingredient. A green light or segment indicates that the food is low in that nutrient. The more green lights, the healthier the choice and the more likely the food is to be a good option for everyday eating. How Can It Help People Eat Better? The traffic light labels appear on the front of food packets, giving a swift and easy guide to the amount of certain foods that most of us should be limiting our intake of. If you are on a special diet or wish to pay particular attention to what you eat, the back of the packet will have more detailed nutritional information which should include a nutrition panel and ingredients list and may also have a guideline daily amounts section. This means that you can pick up a frozen pizza and see from the front of the pack that it has 5 grams of salt. If the soup you were going to buy to eat before the pizza has 3 grams of salt, you know will be over your ideal daily intake and might chose to have salad instead of soup for your starter. Because most of the foods with traffic light labelling will have a combination of red, amber and greens indicators, it’s a good idea to choose more foods that have green and amber labels and fewer than have red labels, if you want to improve your eating patterns. Who Uses Traffic Light Labelling? Originally only certain supermarkets were using the traffic light labelling system, but now some rail companies have taken up the symbols to use on the front of the sandwiches and snacks they offer their customers, and some airlines are considering offering the system during domestic flights to enable travellers to choose between foods that will help them balance their daily intake. It is hoped that schools will take up the system too, allowing children to learn about healthy nutrition and food choice from a very early age.